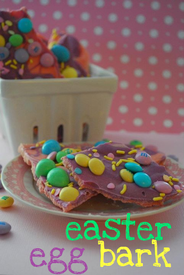 Easter Egg Bark, and it’s totally pretty, easily wrappable and addictive, of course. I love making bark because of how easy it is–just melt some chocolate, spread it in the pan any thickness you like, and sprinkle your favorite nuts, chips or candies on top. It’s really that mindlessly simple.